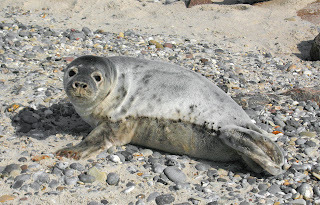 True Wild Life | Grey Seal | The grey seal is one of the rarest species of seal in the world with around 40% of the grey seal population inhabiting the cooler waters around the United Kingdom. Grey seals are the biggest land breeding mammal in the United Kingdom, but are superbly adapted for life in the sea. Adult grey seals have 2 layers of thick fur and a thick blubber layer of fat to keep them warm at sea. 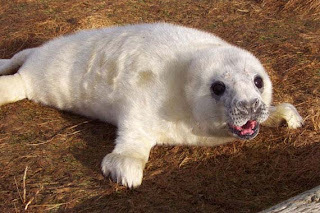 Grey seals get all the water they need from their food and a well hydrated grey seal will have bright eyes and tears. Grey seals feed mainly on squid and fish but the grey seal prefers to hunt sandeels and the seabed. The hands and feet of a grey seal are formed into webbed flippers with 5 strong claws on each. The grey seal has very powerful rear flippers that propel them through the water, using their tail to help steer. The grey seal also has very powerful shoulders that enable the grey seal to haul out onto steep and slippery rocks, even in a big swell. Life is hard for Grey Seal pups. About 30 to 50 percent of them die before their first birthday. Grey seal mums recognise their own pups calls and know exactly how their own pup smells. The Cornwall Seal Group in south west England was set up to monitor the presence (or absence) of seals in a north coast colony. Thanks for this great information. Just thought you'd like to know, the photo at the top is a common seal, not a grey! 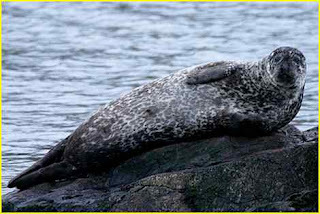 See www.cornwallsealgroup.co.uk for plenty of images of adult grey seals.